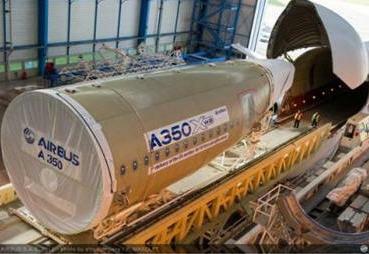 April 26, 2012 - Airbus has delivered the aft fuselage for the A350 XWB static test airframe to the final assembly line in Toulouse (France). This final section of the fuselage will be assembled with the front and centre fuselage sections which were joined up in early April. Assembled at Airbus’ site in Hamburg (Germany), the 20 meter long carbon fiber aft fuselage is made up of the rear fuselage barrel, produced at Airbus’ Getafe plant (Spain), two lateral aft fuselage panels made by Premium AEROTEC (Germany) plus the upper and lower aft fuselage panels manufactured by Airbus in Stade (Germany). The Airbus A350 is a family of long-range, wide-body jet airliners under development by European aircraft manufacturer Airbus. The A350 will be the first Airbus with both fuselage and wing structures made primarily of carbon fiber-reinforced polymer. It will carry 270 to 350 passengers in three-class seating, depending on variant. The A350 was born as an A330-derived minimum-changed competitor to the Boeing 787 Dreamliner and the larger Boeing 777, but was unanimously rejected by prospective customers. Airbus was forced to redesign the initial proposal, but airlines voiced for a complete overhaul. The eventual proposal incorporates major changes, which Airbus says will be more fuel-efficient, with up to 8% lower operating cost than the Boeing 787. The redesigned A350 was marketed by Airbus as the A350 XWB, where the XWB stands for Extra Wide Body. The launch customer for the A350 is Qatar Airways, which ordered 80 aircraft across the three variants. Development costs are projected to be 15 billion. The airliner is scheduled to enter airline service during the first half of 2014. As of 20 January 2012, 561 orders had been placed for the new aircraft. When Boeing announced its Boeing 787 Dreamliner program, it said the lower operating costs of this aircraft would make it a serious threat to the Airbus A330. In public announcements, Airbus initially rejected this claim, stating that the 787 was itself just a reaction to the A330, and that no response was needed for the 787. Airlines pushed Airbus to provide a competitor, as Boeing had committed the 787 to have 20% lower fuel consumption than the Boeing 767. Airbus initially proposed the A330-200Lite, a simple derivative of the A330, which would feature improved aerodynamics and engines similar to those on the 787. The company planned to announce this version at the 2004 Farnborough Airshow, but did not proceed. On 16 September 2004, then-Airbus president and CEO Noël Forgeard confirmed that a new project was under consideration during a private meeting, which was held with prospective customers. But Forgeard did not give a project name, and did not state whether it would be an entirely new design or a modification of an existing product. The airlines were not satisfied, and Airbus committed €4 billion to a new airliner design. The original version of the A350 superficially resembled the A330 due to its common fuselage cross-section and assembly. A new wing, engines and a horizontal stabilizer were to be coupled with new composite materials and production methods applied to the fuselage to make the A350 an almost all-new aircraft. On 10 December 2004, the boards of EADS and BAE Systems, then the shareholders of Airbus, gave Airbus an "authorization to offer (ATO)", and formally named it the A350.